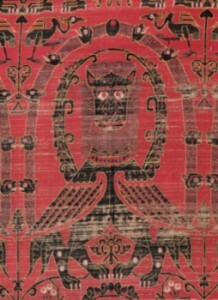 Up to now this silk fabric of the second half of 12th century has never left Spain. Before it goes back to Vic, after restoration in the Abegg-Stiftung, it will be exhibited a few days and it can be seen in this unique exhibition until 18th of November. Because of its brilliant coloring, its red background with many stilistic details this fabric it thought to be woven in Spain in the 2nd half of 12th century. In this time spanisch silk fabrics were in great demand and sold all over the world. The fabric with the very unusual size (original width 260cm and former hight 135cm) is well known because of its dominant demonic being. There is no second or similar fabric preserved. And therefore it belongs to the most famous medieval silk weavings.